It's not even very high-maintenance. The idea of making their own kefir does put some people on edge, but it's very simple, and totally fool-proof. The only issue is that kefir grains are hard to come by - you can't get them in supermarkets. Generally the best place to get them is from someone who is already brewing kefir (see below), because kefir grows as you feed it, giving you a little more with each batch of milk, and in time, they will end up with too many and will want to get rid of it. It's really just a simply daily ritual of setting kefir grains in a jar with 250ml of milk for every 5g of grains, leave it on the countertop for 24 hours (the bacteria stops the milk from spoiling) and then straining it into another jar the next day, and then repeating the process. It keeps the grains alive and, as long as you have milk, a constant supply of kefir milk. And if you wanted to pause the process due to holiday or an abundance of kefir milk, you can put half the milk into the jar with the grains and set them in the fridge, which slows their metabolism. You'll need to change the milk every 5 days, but they will remain quite alive and well-fed without leaving you inundated with kefir. If you're going on holiday, a friend or family member can change the milk when they feed your cat or water your plants. It may be a strange request, but if they're interested in kefir, you can always repay them in the excess grains you're sure to end up with in time. Pronounced 'keh-FEER', kefir milk is a probiotic-rich drink that has been consumed for nearly 2,000 years, and is made from the fermentation of kefir grains in milk. Kefir grains are not grains at all. They are only called 'grains' due to their appearance, so if you have Coeliac's or a gluten intolerance, they're totally safe to use. Kefir grains are in fact a microbiological culture of bacteria and yeast which co-exist with one another and the milk cultures they feed on. Here's a list of the most common bacteria strains and yeast strains found in milk kefir grains. But, because grains are born and bred from the milk they're stored in, changes in the milk can also change the strain composition, so there's no real way to guarantee just what exactly is thriving in your grains and subsequently what the probiotic make up of your kefir milk will be. But, there's no need to worry about such microscopic details, because, whatever strains are in your grains, they and the probiotics they provide are absolutely wonderful. First, and most importantly of all, because of probiotics! Probiotics are microorganisms that help to keep the balance of good bacteria in your gut, which you need for healthy digestion. In the West, the best source of probiotics is yogurt, but that's only because kefir isn't as easy to manufacture or distribute due to the nature of kefir grains. In the East - where kefir originated - kefir comes top, and is actually much more potent than yogurt, due in part to the ease of creating the milk and to the direct nature of the grains. Secondly, there are the added antibacterial benefits - the kefir-exclusive probiotic Lactobacillus kefiri itself has been proven to inhibit the growth of salmonella and E. coli bacterias. Kefir milk is also much lower in lactose than other dairy products, making it great for people who are lactose intolerant. This is because the kefir's bacteria turns the lactose into lactic acid, greatly reducing the lactose content of milk. All this for the one-off purchase or acquisition of grains, and the cost of a weekly 2-pints of milk. Where did kefir come from? About 2,000 years ago the grains were 'discovered' in the Caucasus Mountains, between the Black Sea and the Caspian Sea in Eastern Europe and Southwest Asia, and its name comes from the Turkish keyif, which means 'good life', as in 'health'. The local people regarded kefir grains as a gift from the gods and every household held them in great value due to their abilities to preserve and enhance milk. Their kefir grains were kept a secret from the West until the early 20th Century when it was shared with Russia. Kefir has been made for 2,000 years now, and today is a staple food in Russia. What do kefir grains do to the milk? Kefir grains are living organisms, and so they need to feed in order to grow. We add the kefir grains to milk to ferment it for our own use, but as far as the grains are concerned, we're looking after them and feeding them like we would a dog. Or, rather, water a plant, I suppose. The kefir feed on the milk and expel their waste into it - but from our perspective, that 'waste' is what we want. They're the probiotics. Kefir grains don't feed on milk as a whole, only one part of it: the lactose. Lactose is dairy sugar, and because sugar - glucose - is a source of energy, that's what the grains want. And so, during the fermentation process, the kefir grains will eat the sugar and replace it with probiotics instead. This lowers the lactose and sugar levels of the milk immensely, which in turn reduces the calories of the finished kefir milk, too, as sugar contains 4 calories per gram. The rest of the nutritional profile of the milk you used to make your kefir remains in tact - the fat content, protein levels are all unchanged. The sugar has simply been replaced by probiotics. Why make your own kefir? It's true that you can buy bottled kefir milk in some supermarkets, but they're usually riddled with all kinds of extra ingredients, the mechanical processes generally mean that metal has come into contact with the grains at some point, or the mass produced nature of it and poor storage means a lot of the goodness is lost. But that doesn't mean it isn't an option, as not all brands are like that. But homemade is always best - and this goes for most things - because you keep every ounce of goodness, you know the grains are well-looked after, and you have full control over the source and quality of milk, be it straight from the farm, organic, or run-of-the-mill 50p a pint supermarket milk. Either way, it will be better quality than bottled kefir milk, and much cheaper - once you have the grains, it will only cost you whatever the milk does. Homemade kefir milk is also much cheaper than an Actimel a day, and far more nutritious. Making kefir yourself also isn't the daunting prospect it seems. It's so straight-forward, and after you've done it once, you're practically already a pro! Kefir grains can only be obtained from someone already brewing kefir. This is because they cannot be grown any other way, as the polysaccharides, bacteria, and yeasts that make up kefir grains are handed down from generation to generation - ie, as they feed on milk cultures and multiply. It doesn't take much effort to get them to multiply, however, just the active creation of kefir milk - if you take it up yourself, you'll very likely find yourself in a position of having more grains than you need, in time. So, to obtain fresh kefir grains, ask a friend, relative, neighbour, or see if you can find someone on gum tree or the like who wants to get rid of them. Alternatively, some people do sell their excess kefir grains online, such as Symbiome, shipped in a food-safe ziplock bag with enough milk to keep them alive in transit. This obviously means they can only be shipped nationally, but it also means that you can obtain them easily enough if there's no one nearby who you can obtain them from otherwise. Fresh kefir grains are always the best choice because they can produce a near-immediate, drinkable product compared to dehydrated grains, and they are healthy (as living organisms) because they've not been subjected to drying or other rough handling. Obtaining is another option, and is easier because, without the need for milk to keep them alive, it's easier to ship them without concern of milk leaking (though if it's double-bagged it's probably fine). It also means you don't have to use them the day they arrive on your doormat, instead you can keep them for the weekend, when you may have more time. The trouble with dehydrated kefir grains is bringing them back to life. To rehydrate dehydrated kefir grains you have to empty them into 1 cup of cold milk, cover with a cloth or an unscrewed lid as you would when making kefir milk, and leave it at room temperature. After about 8 or so hours, you have to start checking the milk regularly, looking for a change in consistency. Once you notice the milk has started to thicken, you must remove the grains, strain them and transfer them into a cup and a half of fresh milk, then cover and set aside as before. If, however, no change has occurred in 24 hours, strain them into one cup of fresh milk and repeat until a change occurs. This goes on for 3-7 days, increasing the amount of milk by 1/2 a cup every time up to a total of 4 cups, until the dehydrated kefir grains have activated, and only then will they start producing true kefir milk and can be treated as fresh grains are. Here's a longer description, with process pictures. Deyhdrated grains will yield a poorer quality of kefir milk for a while because they'll still be sluggish, but they will pick up in time. All of this means that dehydrated grains can be quite inconvenient - the balance of shipping convenience to the inconvenience of activating them makes dehydrated grains, overall, a poorer choice. Kefir milk can be made without grains, but it will not provide the same properties as that made with grains. However, the finished product will have a very similar thickness and taste to true milk kefir, so it's good if you just want to try it. This is made with a powdered kefir starter culture, a proprietary blend of bacteria that mimics those in kefir grains, but, unlike kefir grains, the kefir starter culture is not re-usable. It's one time only. You will have to buy the culture each time you wish to make kefir milk, but that does make it a better option if you only want to make kefir every now and then. How do you make kefir milk? It's not difficult; once you have the basic necessities - a plastic seive, a glass jar, a wooden or plastic spoon, some full-fat milk from cow or goat, and, of course, the grains - you will have a never-ending supply. It's a one-time purchase, except for the milk itself. The reason you need non-metallic utensils for making kefir is because kefir grains are naturally acidic and readily react to metals. If the grains come into frequent contact with metal - such as a metal sieve or spoon each time you make a batch - the grains will become contaminated and so will the milk they go on to feed off and you will subsequently drink. Over a long period of time, these toxins can become lethal. Stainless steel is the only exception, but in the end, it's best not to chance it, if simply for the health of the grains themselves. Plastic sieves, glass jars and wooden spoons are not hard to come by. The reason you want to use full-fat milk for making kefir is because the grains thrive on the fat. You can use 2% and reduced fat milk, but it may take longer to ferment. Animal milk is also best - other 'milks' such as almond, soy or coconut yield inconsistent results, and the grains will still need to be bathed and revitalised in animal milk for 24 hours every few days. This is because the milk is what the grains feed on, and if you give them something other than their natural diet, they won't be able to gain the nutrients they need to survive. Unlike humans, kefir grains can't take supplements. Read here for more info on choosing milk for your kefir. 1. Put the kefir grains into the plastic seive and rinse with fresh milk. 2. Empty the grains from the seive into a jar and pour more milk on top of the grains - 250ml for every 5g of kefir grains. If need be, hold the seive upside down over the jar and pour milk through the upturned seive to loosen any grains still there. 3. Stir it gently, then set the lid on top loosely so the gas created during fermentation can escape - if it's a metal lid, it's fine, because it shouldn't come into contact with the grains even if you're not all that careful. 4. Set it out of the way at room temperature and out of direct sunlight for 24-48 hours. The bacteria in the grains stops the milk from spoiling, and you'll know when it's done because there will be a clearer liquid at the bottom of the jar - this is the whey, which has separated from the curds on top. 5. When it's done, stir it so it's all nicely combined, set the plastic seive over a second, empty jar (I used a 1 litre jar with the intention of building up a supply) and strain the kefir through it, catching the grains and letting the milk pass through. The milk is then fully fermented and drinkable right away, or you can screw on the lid and store it in the fridge, where it will keep for 2-3 weeks. After your first batch, you have two options: make more kefir to add it to the jar in the fridge to top up your supply, or take a break. 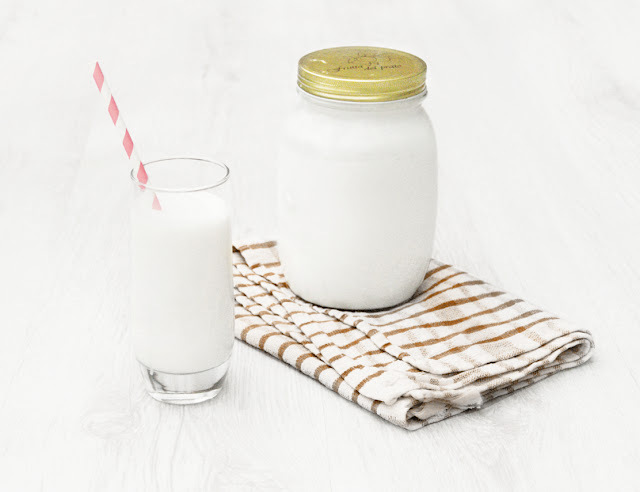 To make more kefir, go back to step one, putting the grains back into the first jar and adding another 250ml of milk, stir, set the top on loose and set it out of the way for 24-48 hours. Strain this directly into the refridgerated kefir milk you already have and give it a stir to combine it all. If you choose to take a break from making kefir, go through those steps but with only 120ml of milk, set the fermenting jar in the fridge, which will slow the fermentation drastically, and will just keep the kefir alive. Make sure to change their milk every 5 days. This means you can go on holiday without losing your grains - just give your jar to someone to look after. Instead of watering your plants or feeding your cat, they'll be feeding your kefir. It's both sweet and sour at the same time, but not in an unpleasant or pungent way, and also slightly fizzy! I was a bit hesitant when I first tried it - at the very least, if it hadn't worked, I would have been drinking milk that had been sat out on the counter for 24 hours. So my first sip was tentative. But I was pleasantly surprised, if also a little startled, because I never knew that 'fizzy' could describe texture and taste. What can you do with kefir? ...Use it as an alternative to milk in shakes and smoothies (the fizziness will be lost), or pour it over cereal and fruit! Really, it can be used in any way you would use milk or yogurt - you can even make a salad dressing by adding some herbs and spices to it, or make frozen yogurt or yogurt popsicles with fruit and granola. You can also cook with kefir, using it in place of milk in cooking and baking, but probiotics are bacteria, and the probiotics will be killed when heated, just like any other bacteria. I Think I'm Ready For Book Two!